As a local painting company, we see our fair share of different homes. It’s a wonderful thing to be able to see all of the unique and creative ways that people showcase the things that they love in their living spaces and it’s always an inspirational thing to take in. At Barco’s, we believe that a home should be the place that people turn to for rest, relaxation, and enjoyment. As Dorothy put it so well so many years ago, there’s no place like home. It just makes sense to want that space to feel like it’s your own. As you probably know very well by this point, color plays a huge role in the way that people perceive your home. Numerous studies have shown that colors can have different effects on people as well. For example, shades of blue and green are often associated with calm, while reds, yellows, and greens are associated with energy. In other words, getting the color scheme just right in your home can have a bigger difference than you may even realize! That’s why in today’s post, the team at Barco’s will be sharing a few tips on what you can do to help make certain that everything comes together beautifully. You deserve to live in a home that you actually enjoy spending your time in and we’d love to be a part of that process. Keep reading to learn more. One of the most important things to consider is the stuff you already have in your home. For example, what color are your bookshelves? Do you have art on the wall that you want to keep up there? What color is your couch? Playing off of the other details in your home can help to make sure that you get it just right when the time comes to put paint on the walls. When people come to us for interior painting, sometimes they have found that they’re ready to make a big change in their homes. That’s why it’s also important to think about the other things you’d like to switch up in your home. If your home decor previously consisted of hand-me-downs and you’re now going for something a little more modern, think about the colors of the new items you’ll be adding to your home. Here’s the most important tip: don’t forget to use our professional painting company as a resource! We know how tricky it can be to get things just right and you want to make sure that it all comes together in a way that makes sense to you. 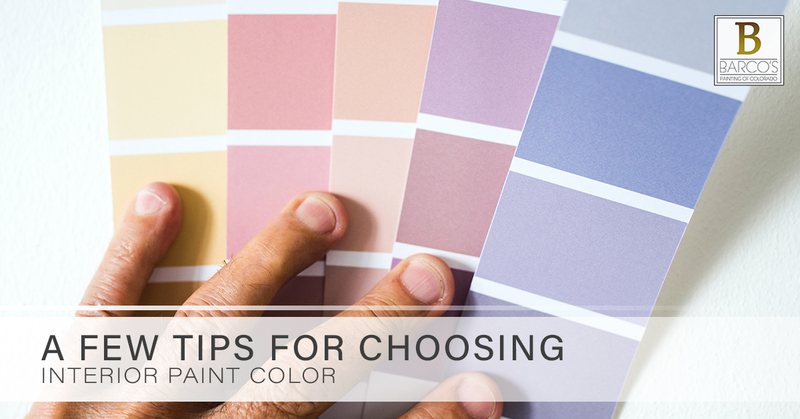 Fortunately, we offer a free color consultation and we can point out things you might not otherwise consider. Whether you know exactly what you want or you could use a trained eye to help you make the right choice, you can count on our team to give you some peace of mind. It doesn’t get much better than that! We strive to be the best interior painting company in Castle Rock and the surrounding area, but what do we do to make certain that we are? For one, we’re a local company who specializes only in painting services. That means we’re not also trying to focus on selling you windows, replacing your roof, or building you a deck. And speaking of sales, you’ll find that we don’t do the whole high-pressure-sales-tactics thing. We believe that you’re capable of making the right decision and we won’t try to turn the screws to get you to choose us. Instead, we’ll give you a written estimate of the work that needs to be done, then we’ll make ourselves available. The choice of what to do is entirely up to you! Our owner, Jeremy, is also a project manager. He’ll be your main point of contact throughout the process. This is important because it means you’ll be dealing with someone who is invested in the outcome of your project. Speaking of which, we apply all of our paints according to the recommendations of the manufacturer to ensure that it looks beautiful and stands the test of time. Our crews are fully insured, and in addition to being accredited through the Better Business Bureau, we’re also a member of the Castle Rock Chamber of Commerce. At the end of the day, we want our customers to know that we truly do want to be the best at what we do. When it comes to interior painting, the painting contractors at Barco’s will get the job done the right way the first time around. Contact us today to get the process started. We look forward to hearing from you!